How much are you willing to pay for healthy food? It’s a priority for our family, so I think we generally spend more than most. But, I’m pretty sure Jeff thought I’d lost my mind when I recently paid $11.99 for a bag of cereal. A very small bag. I first heard about Holy Crap Cereal on an episode of Dragon’s Den and I’d been hoping to get my hands on some ever since. It’s a Canadian product that was highlighted on a Canadian TV show, and they raved about it. (If you don’t live near Canada like we do, you’ve probably never heard of either one.) The American version of the show is called Shark Tank. On it, entrepreneurs pitch products to tough-minded investors, affectionately called dragons or sharks, and healthy food items are often featured. Imagine my delight when my sweetheart and I were wandering the aisles in a grocery store in Parksville, British Columbia and I laid eyes on a bag of Holy Crap way up on the highest shelf. I immediately grabbed the green foil pouch, then saw the $11.99 price tag. I stood there for a while, trying to decide if it was worth it. You only use a small amount, so you can’t really compare it to the regular puffed up volume of the airy cereals…but still, this bag only had about 8 or 10 servings in it. I rationalized that we don’t get to Canada all that often, so I decided to take advantage of the opportunity and tossed it in the cart. It’s a good thing I did; I am totally hooked. I love the way it smells: earthy, like freshly harvested grain. I love the way it looks: at the right angle, the buckwheat groats look like tiny little hearts on my spoon. And the flavor is really remarkable considering there is no added sugar. The name is quite fun, too, but my favorite part is the texture. I can’t get enough of the crunch. Crunchy, crunch, crunch. Since I returned to the US of A, I’ve been trying to recreate this divine stuff for less money. One option I found at my local co-op is virtually identical: Nature’s Path Qi’a Chia, Buckwheat and Hemp Cereal. It’s only $7.99 for the same sized 8 ounce bag, but my homemade version cost $4.73 for an equivalent 8 ounces ($9.45 for the full 1 pound recipe). It’s not what you’re used to. It looks like bird seed, you don’t get to eat very much, and it’s best if you let it soak in milk for a minute before you dig in so it can sort of gel up. Are you convinced yet? Once you get the right ingredients, I’m not sure there’s a secret ratio that creates the magical taste. This is what I came up with and I was quite satisfied. Store in the refrigerator and get ready to be wowed. 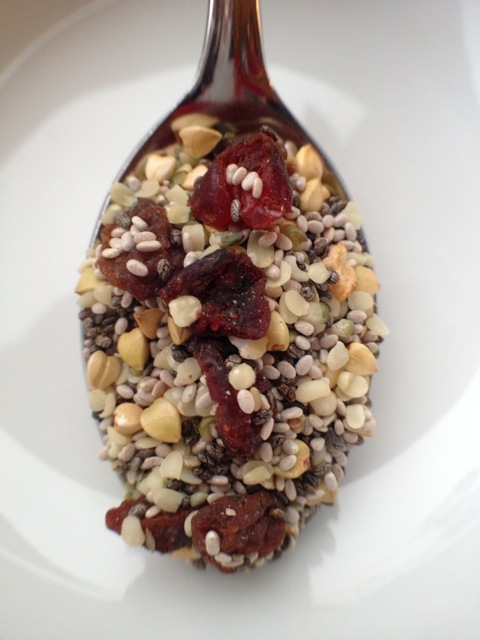 Inspired by Holy Crap Dragons' Blend and Nature's Path Qi'a Chia, Buckwheat and Hemp Cranberry Vanilla cereals. The serving size on the name brand packages was 2 tablespoons, so for comparison, that’s what I used to calculate my nutrition facts. But, when I have it for breakfast I use 1/4 cup, or 2 servings. Get ready for a different cereal-to-fruit ratio than you’re used to. My breakfast bowl is mostly fruit, with just a bit of this cereal mix for crunch. I make the same argument for calorically-dense granola in this post: Cherry Maple Granola. I’ve basically been following the directions on the package, only a little on the dry side. I mix 1/4 cup of the cereal with 2 to 3 tablespoons of soy or almond milk. Then, I let it set while I prep my fruit. You could use this yummy mixture in lots of other ways, too, like sprinkling it on yogurt or adding a couple of spoonfuls to your favorite hot or cold cereal. This was the first time I’d ever bought buckwheat and the bulk section at my co-op had two kinds. One was labeled buckwheat groats, which is what I used. These groats varied in color – some were very pale green, some were yellow and others were kind of beige. The alternative was labeled buckwheat kasha. It’s been roasted and is quite a bit darker brown and uniform in color. I also got my dried cranberries in the bulk section. They were sweetened with apple juice concentrate and had some sunflower oil added. My chia seeds, dried apples, raisins and buckwheat were all organic. Spending an embarrassing sum of money in a foreign country in this case turned out for the best. I have a new favorite breakfast thanks to some Canadians, some dragons, and a husband who lets me spend like a drunken sailor on the cereal aisle. Have you had any luck recreating a favorite product at home? This looks absolutely delicious and healthy! Hi Sydney. I’d love to know what you think if you give the recipe a try. I hope you think it’s as delicious as I did. yes! can’t wait to try this, always looking for more homemade brekkys! Hi Rachel. Thanks for your comment. I get stuck on breakfast ideas, too, just like everybody else. I think that’s why I was so excited about this because it’s healthy AND yummy! Thank you, thank you, thank you!!! I’ve been eye-balling this cereal at my local health food store for the past month or so but just couldn’t bring myself to pay $10 for cereal!!! I thought… “Hmmmm…somebody MUST have figured out a homemade version for less” and sure enough I find your post. Thanks!! I’m 32 weeks pregnant and anemic but supposedly this cereal is very high in iron (10%RDA). Thanks again – can’t wait to try it!! Hi Hanna. I’m so glad you found what you were looking for! Best wishes for a happy, healthy pregnancy and delivery. Hi there, Hanna. Just spotted your comment about being pregnant and anemic. I had the same problem. I tried everything to up my iron with no success at all until my nutritionist recommended upping my intake of trace minerals. I was skeptical, since she wasn’t giving me anything in the way of iron at all, but it really did the trick! All the best with your pregnancy. Working with a nutritionist or dietitian is a great idea, especially during such an important time as pregnancy. Great tip, Carey! The Academy of Nutrition and Dietetics has a “Find a Registered Dietitian” tool on their website. Hanna – you can find it here: http://www.eatright.org/programs/rdfinder/. I made the cereal by the way. Delicious! I could only find Kasha buckwheat though and I don’t enjoy the toasted flavour it adds to the cereal so much (it’s a little burnt tasting). Luckily I found some groats in a nearby city and my next batch will be better. First I got a bag of the Xi’a after reading your post to see if I liked it. I recently started Mark Bittman’s vb6 – vegan before six food plan and think I might as well just do it 24/7. your site is perfect for me since I have so much to learn. anyway I. love this stuff – a taste adventure with almond milk! its only been 11 days but I’ve. lost 4 lbs and don’t feel all bloated anymore. bravo! Hi Leslie. Congratulations on your weight loss – that’s so great! I’m glad you like the cereal. It does seem like a good fit for Mark’s vb6 plan. Thanks for stopping by the site. I am a Canadian who is already obsessed with Holy Crap / Dragon’s Blend. I am excited to give my pocket book a rest and try your recipe. Question- do you have to do anything to the buckwheat groats? I am getting conflicting reports here about boiling them, which I think would no longer label them “raw”, and soaking them in water for an hour, etc. some do not mention any of this which leads me to believe you just toss them in “as is”? What do you do? Hi Allison. So nice to hear from another fan of Holy Crap. I must admit I wasn’t that familiar with buckwheat before I experimented with this recipe. But, you’re correct, I didn’t soak or boil them first – just tossed them right into the mix. Maybe I’m missing something, but it seemed to work just fine. Good luck with making your own. I’d love to know what you think. WOW. holy crappp. Homemade is the way to go. Thank you for being an inspiration in the kitchen. You have saved me mass amounts of money compiling these beautiful ingredients myself. keep it up!! Hi Meghann. Thanks for your kind words and for taking the time to comment. I agree…it is so worth making it at home considering how easy it comes together – just a little measuring and stirring and you save big bucks. 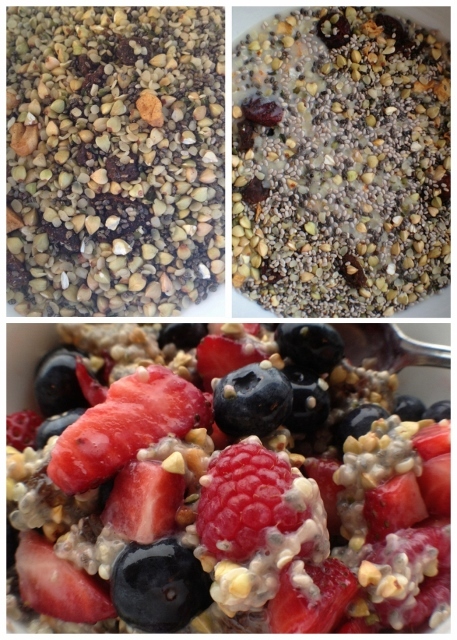 I have been making this for myself for the last few years as well…for the same reason, price tag on the holy crap bag…I eat it everyday with some yogurt and berries….this is so good for ur health, especially for regularity….I also add some wheat germ in there for some added benefits, not that it needs more lol. I buy everything in big bulk amounts and make a huge batch, then separate into containers and put in freezer to keep it fresh. I am actually from Campbell river, which is just a short distance from parksville, beautiful area. Hi Kristy with a K. 🙂 I like your idea of making a bigger batch for even more $ savings, and then freezing it. Thanks for sharing! Hi!! thank u so much for this.. i tried something very similar to ur canadian cereal here in Singapore and really loved it, except that it was way way waaaay too sweet! so i decided to make my own version. i am going to add quinoa as well! The only thing i wanted to ask is, would the buckwheat groats be crunchy and edible without cooking them first?! Hi Elly. That’s one nice thing about making stuff from scratch – you can control the sweetness and make it perfect for your own tastes. 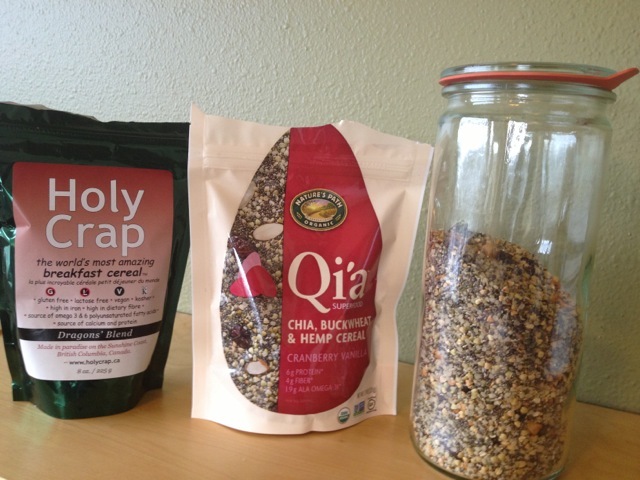 Thanks for taking the time to comment and share your idea for quinoa! Oh thank u so much. I appreciate u taking the time to explain this.. I just opened a pack of buckwheat and u are right!! It is crunchy and edible!! And it is the same as the one i bought. So thank u once again! Thank you! Didn’t dare try a bag of mystery product for over $10 for such a small amount. Made this today with only the chia, hemp and buckwheat. Ate with plain yogurt and two chopped dates and cinnamon. Very good. Also glad you clarified that the buckwheat needs no prior preparation. Very much appreciate this recipe and will now have to check out the rest of the site. Hi Forme. I’m glad you were happy with the recipe. I really like your idea of adding dates – I think I’ll have to give that a try. Thanks for taking the time to comment. It’s so nice to hear how everyone else personalizes things to make the recipe their own. The Roasted Maple or the Cinammon with the Holy Crap = yummy in the tummy, lol. Well, I’m definitely going to have to search out the Omega Crunch. Looks like a cool product. Thanks for the tip! Wooo hooo thanks for coming up with a recipe. I am just finishing a back of Qi’a we got at Costco, and Costco seems to no longer be carrying this product! Plus I’m cheap and love to save $$. Thanks again! Hi Bobbie. I imagine getting this kind of cereal at Costco would be quite a bargain. It’s cool that they carry healthy products, but it’s nice to have a back-up plan for homemade cereal when they change their minds! Thank you so much for this post! I just tried Holy Crap at The Delicious Food Show in Toronto this past weekend and made it my mission to try and recreate it myself on a budget. Thanks for taking the guess work out of it. I’ve got my Almond-Coconut milk ready (Chocolate Soy was also good) and am hitting the health food store tonight! Hi Lise. Sounds like you’re all set for healthy breakfasts! I’d love to know what you think after you try the recipe. I eat this every morning. I like to use coconut or hemp milk and sometimes I put a little (Vega) chocolate protein powder in mine. I love it. I am going to also say that I have never had healthier bowel movements! Thanks for sharing the recipe! Hi Kathy. I love the idea of adding a little chocolate flavor for variety. I am totally going to use that. Thanks for the tip! As an FYI the buckwheat grouts are available at Whole foods in their bulk section. I also find that by soaking the cereal overnight, the buckwheat is less crunchy, it still has a bite to it, but a softer bite. I have also just tried mixing a big batch, (225g of cereal mixed with 3 cups water.) and have it soaking in the fridge, enough to last me the week. Keep in the fridge and scoop out a 1/2 cup serving each day. i eat mine with plain Greek yoghurt and fresh fruit. Hi Carol. Sounds like you’re a seasoned pro at this homemade cereal business. I’ll definitely have to try soaking it overnight, just to play around with a different texture. Thanks for taking the time to share your CC’s expertise! Hi! I’m trying to make the Qia cereal at home by buying the individual ingredients. I’m confused on what type of buckwheat groats to buy. There is also hulled buckwheat groats. I want to be able to just eat the buckwheat groats out of the bag as a cereal with almond milk with other seeds. Could you advise me? I saw the Rob Mills whole grain buckwheat groats but it says that you have to boil it. I’m so confused. Help! Hi Anne. Well, I saw two kinds of buckwheat at the store when I went to buy mine: kasha and buckwheat. Mostly I chose by appearance, comparing to what I found in the Qia and Holy Crap bags. So, this would be my best tip for you as you’re shopping for some. Can you tell from the picture and description in my post what it looks like? Specifically the color? 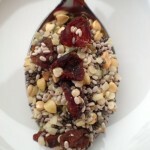 If not, there is a nice picture of the buckwheat by itself in this post by Kath Eats Real Food: http://www.katheats.com/buckwheat. So, if you get the kind that looks like mine or hers, you can eat it straight without any preparation. I took a peek at the Bob’s Red Mill product on their website and from what I can tell from the picture, it looks right, but I’d want to see it in person so I could look at it up close to be sure. Hope this helps. Yea the pictures in both your page and the other blog is exactly it. The bag of Qia cereal you show on your page is exactly what I had too. There is no whole foods store near me. Just the regular supermarkets 🙁 What’s the brand of buckwheat oats that you buy? I am going to order online. I actually bought mine in the bulk foods department at my local Food Co-op, so I don’t have a brand name. 🙁 If you order online, I bet Bob’s Red Mill is a good bet. From what I can see from their photos, it looks like the same color as the stuff I bought. I hope you have good results! How long is the mixture good for in the fridge? I can’t wait to try this! Hi Melanie. Well, I’m not exactly sure how long it would last in the fridge, so I did a little detective work. I bought my Holy Crap in February 2013 and the bag says “Best Before August 13, 2013”, with instructions to refrigerate after opening. That would be about 6 months. Since our homemade product wouldn’t packaged and sealed like the original, I’d say I’d go with their conservative estimate of 3 months. Just saw this cereal in at Whole Foods and didn’t buy because of the price. I just headed over to the bulk section so I could make my own. I can’t wait to try it! Hi Ann. So glad you found this recipe at the right time. Hope you love it as much as I do. Thanks for the recipe. I love it. I am so pleasantly surprised! I didn’t think I would like this, but I could eat it everyday! Hi Rachel. I’m so glad to know you like it! I can eat it everyday, too. If I change up the fruit I don’t get tired of it because it’s so yummy. I love Qia! I definitely need to make my own. Did you soak & dehydrate the buckwheat groats Or are they ok to eat raw? I didn’t soak mine – happily, they’re OK to eat raw. If you want a more detailed answer, though, scroll up through the comments to August 31 of last year to see my reply to Elly. Thanks for stopping by the site! Hi Amber. They’re OK to eat raw. (For a more detailed explanation, take a peek at my comment/reply on this post on August 31.) But, soaking and dehydrating would be a nice modification I bet, if you liked the texture better. I love the QIA also and would like to make at home but do not know where to purchase these items to go in it. I located the times. Thanks you for posting this recipe!! I also add the flax seed. Love this and cannot live without it. Hi Kimberly. That’s great! I’m glad you found the ingredients. Happy eating! I love the Qia cereal, but not the price tag. My local Costco carries it, but it’s still expensive. Do you put the buckwheat in raw or do you have to cook it first? Thanks! Hey ! 🙂 I made this cereal too, but instead I used like 1 cup for basically every ingredient there and I also added to that 2 packages of Qia Cereal. Now, how do I know the calories of all those ingredients that are all 1 cup each and the 2 packages of via cereal. I know it sounds confusing , but if you can help that’d be wonderful and very appreciated 🙂 ! Hi Michelle. It’s such a yummy mixture of ingredients, I bet it tastes good in any proportions. And using 1 cup of everything sounds a whole lot easier and faster than my recipe! To find out the calories for your version, you can use the My Recipe tool at SuperTracker. https://www.supertracker.usda.gov/myrecipe.aspx Before you start, add the Qia Cereal to the database as a new food. Here’s a video that shows how: http://www.youtube.com/watch?v=ijx0cqeUzFM&feature=youtu.be Then, you’ll be able to select it as an ingredient. Best of luck to you! Love this! When I moved in with my bf, I discovered a bag of Q’ia cereal in his fridge. Thought I’d give it a try. Loved it mixed with fruit and greek yogurt, soaked overnight. I just made my own huge batch – I imagine it keeps quite long in the fridge. 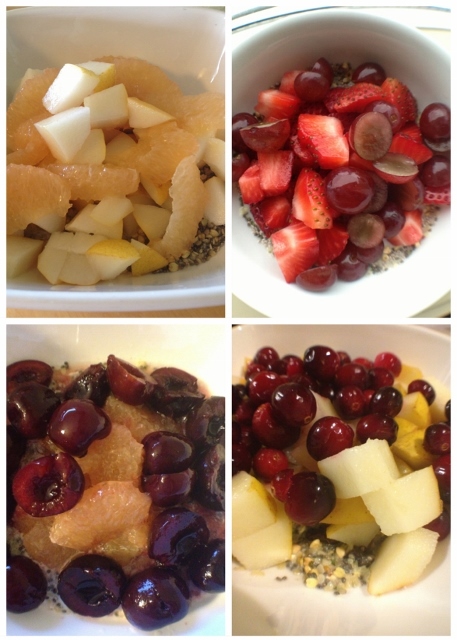 I left out all the dried fruit, though – that’s too much sugar, especially if I am mixing it with fresh fruit. And I’m not a huge fan of dried fruit. I added pumpkin seeds and almonds. Hi Heather. I bet pumpkin seeds and almonds are fabulous substitutions, and they would add more protein and healthy fats. This recipe seems to be pretty versatile – we can each make it to our own liking and it’s delicious every which way! Thanks for the recipe! My kids LOVE the natures path Qi’a. I soak this in almond milk over night and mash a banana in their morning cereal and they CRAVE this. They sell a 30 oz bag at costco near me for $14.99. We go through a bag a week. I try to feed my kids low sugar and healthy options. We are not vegan or vegetarian…this cereal is a game changer! My 10 year old told me this cereal keeps him full all morning until lunch. Hi Kathleen. It is a great combination, isn’t it? And unexpectedly so filling. So glad your kids enjoy it. Sounds like they don’t need much convincing to eat a healthy breakfast! Kristine – thanks so much for posting this recipe – I , like many had tried Holy Crap, but the price is a bit much (now $12.99 per bag at Sobey’s in Canada!) and have been looking for a recipe to get the proportions right – yours is the best! Got all ingredients at our local Bulk Foods chain and they just also started carrying buckwheat groats (the paler or greener looking stuff – NOT the toasted browner “kasha” variety) and it looks exactly like the bag variety. The Holy Crap site also has a lot of great recipes, from basic use as a cereal to fruit bars, etc. that I want to try with my homemade mix! BTW soaking in fruit juice (water, milk or almond milk also works well too) before putting in oatmeal or with yogurt and fruit also gives a wonderful flavour to food. Thanks again! Hi Pat! So glad you like the recipe. I’ve been meaning to check out the recipes for uses besides just breakfast cereal. Your comment spurred me to finally do that. Happy Holidays to you! I’m from Canada, and a friend gave me a bag of that cereal, and I ended up loving it so much I made my own version too. I just looked at the ingredients and realized it would be much cheaper to just make my own, than the pre-made version. Canadians are known for thriftiness. 🙂 I’m glad you found out about it, and I can’t agree more that it’s delicious. The chia seeds expand with liquid so you feel full from a smaller portion, and they’re supposed to be really good for you. They have a texture a bit like tapioca pudding, which I’ve always loved. Hi Jonathan. Sounds like we both had a similar experience! And I agree, the texture might be my favorite part of the cereal. Thanks for stopping by the site. Thanks SO much for this. I’m off to Bulk Barn. Hi Ains. Good plan to make your own – then you’ll never be without the yummy stuff. So glad you found the site and the recipe. Hope you like it as much as the Q’ia. Holy smokes! I went back to Costco and discovered that I’d paid TWENTY dollars for the bag I’m eating….well, my next stop was Bulk Barn. I’m making your recipe tonight. Thanks again!! Speaking of Costco, I did see a display of hemp hearts at my local Vancouver Costco the other day, but I’m not sure if it’s something they normally stock. I didn’t happen to notice the price, though. Happy to find your post. I now live in Saigon (ok, HCMC if you must) and being from the USA, I bring back some food when I visit my original home. I’m now working through my bag of Q’ia ? (refrigerated for almost a year now and still not rancid) and was hoping to replace it when I returned in June 2015 only to read that maybe Costco no longer carries it. I’ll be going to Whole Foods or PCC (Seattle area) which is fine. It doesn’t hurt to save some money and it is a much more satisfying morning food than ph?. I did discover another way to use this stuff which makes great pancakes. I replaced 1/4 cup of the 1 1/2 cup dry ingredients with some Q’ia and the pancakes came out smelling and tasting great. I let the batter sit for 20 minutes or so before using it on the griddle so that the seeds would lose a bit of their crunchiness. My Vietnamese Ma has no molars. The unused batter kept well and I added a bit more water the next day to reprise the whole breakfast. It was a hit. I also added bananas and spread on a little jam. Maple syrup is ok too, but then I guess you sort of get further away from the healthy food concept. But then, it’s pancakes. What do you expect? Hi Geoffrey. So wonderful to know that someone is reading the blog from so very far away. Thanks for your comment and excellent suggestion. I keep thinking I need to experiment with the cereal mix and find other ways to use it. I will definitely try the pancakes. Safe travels when you return to the US! Soooo yummy! I’ve been looking to recreate a recipe from a vegan delivery service in town. This is easy, tasty and oh so healthy! Thanks so much for sharing! Hi Gail. So glad the recipe made you and your taste buds happy! Thanks for stopping by the site. Just add organic quick oats for a creamier, more comforting version. Then pour hot water over it, let it sit a few minutes, add nut milk or creamer and this is my favorite vegan breakfast. Great tip, Karin. There are so many ways to enjoy it for breakfast! I loved this idea! I kept spending way too much on qia! I bought all the ingredients and make it and pack it for breakfast at work every day. Thank you! Hi Sarah! So nice to hear from you. I’m glad the homemade version is making you happy. Thanks for this recipe! I’m from Canada, and totally addicted to this cereal. I follow the serving guidelines, 2 tbsp, and enjoy it with a bit of milk and blueberries. I googled for a homemade recipe because it’s now $9.19 for a little bag!!! I’m going to give this a try! Hi Kat. So glad you happened upon the recipe. I hope it makes for a still tasty but less expensive breakfast for you! 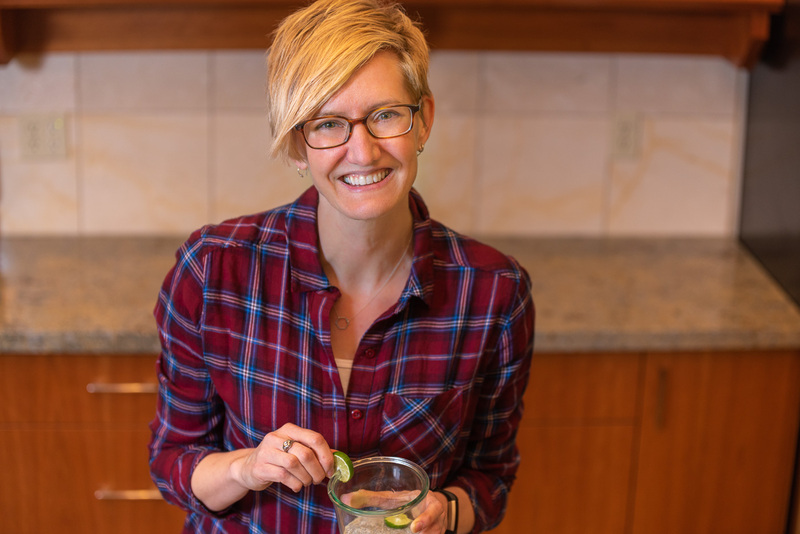 Hi Kristine, I’ve made your recipe and it’s delicious! I made the mistake of using buckwheat (really, what’s the difference?) and found out the “hard” way! LOL! I salvaged the batch by sifting out the buckwheat and replacing with buckwheat groats. Much better, and oh, so yummy! Hi Kat. Yay! And I’m sorry. And yay again! So glad you were able to salvage your batch and that you’re enjoying the recipe. Thanks for taking the time to comment. Q’ia fan here. I bought my own chia, buckwheat, and hemp seeds to make my own. After painstakingly sorting a tablespoon of Q’ia into its components (can you imagine? ), I thought, “somebody else must have done this” and found your page. I think you’re right that the chia and buckwheat are in about equal proportions by volume, but I suspect there may be less hemp in your recipe than Q’ia. It’s quite expensive, so I’m not surprised. Not to worry; it’s all good. My only sorrow is that the company that makes Q’ia did such a great job bringing us this wonderful stuff, and now they won’t get our money. I like to reward healthy innovation. 🙁 But, I’m also going to be making it myself, hypocrite that I am. Hi Jenny. So glad you went searching for the recipe, especially if it saved you a little time. And I agree, I like to support companies that are doing it right. Nature’s Path is actually very close to where I live – they’re just across the border in Canada. Even though I make my own Q’ia, I happily give them my money for their Coconut Chia Granola and their Love Crunch cereal! I LOVE this stuff–I use 5 Tbs full-fat coconut milk and a half frozen banana–mashed up and heated with the cereal. It makes awesome hot cereal, and the banana/coconut milk combo makes it sweet without adding sugar. The full-fat coconut milk also makes it much more filling. Hi Cindi. What a great idea! There are just so many ways to use this stuff. I’m a Canadian, a fan of Holy Crap, and am looking forward to trying your recipe. I enjoy mine stirred into yogurt. If I’m feeling like a treat I add raspberries or blueberries … or both ! Hi Chris. As a fan of the original, I hope you enjoy the homemade version! Pro tip – add protein powder to up the nutrition! I love Holy Crap but have never bought it because of the price. I have made it many times using a similar recipe but I toast the buckwheat at 325 F for 30 min. which gives it a nutty flavour. Sometimes I will add dried coconut, raw sunflower seeds or nuts. Such great ideas for add-ins, and for toasting the buckwheat to change up the flavor. A little variety is always nice. Thanks for your comment! I know this is an old post but I just had to say THANK YOU!!!!! I have purchased the Qia at Costco for a while now and they recently stopped carrying it and I was devastated as I literally had this in some way every single day! I am so thankful for your recipe AND for all of the great add in ideas! Thank you, thank you, thank you! Hi Tywana. Hooray! I’m so glad you happened upon the recipe and that now you can get back in your regular routine. Thanks for taking the time to comment. Really looking forward to giving this a try. Have seen the Holy Crap cereal in my local grocery stores in Canada, and although I do love to support local small business…the price tag for such a small amount is very high and has kept me from purchasing it. I am so glad I happened upon your website and this recipe. Looks so simple and I already have many of the ingredients with the exception of the Buckwheat. Definitely going to whip up a batch of this over the weekend and give it a try. Hi Tanya. I’d love to hear what you think after you give the homemade version a try. Have a great weekend! I found your recipe ages ago and kept meaning to try the weight vs volume measurements. Finally did it and realized that the hemp hearts by weight (5.75 oz) equals 1 cup + 2 tbsp. It certainly is still a great cereal. Does this make a difference? I only use these these 3 ingredients and top with fresh or thawed frozen fruit and kefir, having soaked it in a small amount of kefir to plump up the chia. I have given this recipe away to many people who love it as much as I do. I often take it travelling with me as well. Can I use roasted buckwheat for this or does it have to be groats? It should be groats. I think the roasted buckwheat needs to be cooked before eating. I make my cereal in bulk with chia, hemp seeds, kasha and Omega Crunch shelled flax, and cinnamon. Being diabetic, I forego the dried fruits, and add fresh or frozen berries at the end. I soak my grains in kefir and one heaping tsp. of Nova Scotia Organics BerrySlim smoothie mix. Then I add the berries, and Balkan yogurt at the end just before eating. A heaping tbsp of cereal becomes a full bowl of yummy. I do not cook the Kasha or any of the other cereal beforehand. I often put a tbsp or two of this mixture into my buckwheat pancake mix to give it more boost. I stumbled upon this post via Pinterest while searching for a diy version of the cereal. I opened the link to see you bought yours in little old parksville which is my hometown. Sometimes it is fun to be reminded that it is a small world! Just curious why you have to refrigerate it? My frig and freezer are usually full, and I also like to travel with this and keep it in my desk drawer at work. I don’t refrigerate the Q’ia version, is the homemade variety somehow different? Hi Donna. If you eat it rather quickly, you don’t need to refrigerate it. But if a batch is going to be around a while, I like to keep it in the fridge because of the seeds. They contain unsaturated fats which can go rancid more quickly. I’m probably erring on the side of too much caution. Recipe looks good. I buy the original Qia and add my own dried cranberries(Patience brand). They are a little more expensive but very well worth it! Some days I put a small amount of organic gluten free quick oats, about equal amounts original Qui, about a tsp. Of pumpkin seeds, about a tsp. Of raw shelled sunflower seeds and cover with boiling water plus some. Let sit for a few minutes, add 1/2 tsp. Ceylon cinnamon and a smidgen of maple syrup. Delicious!! Thanks for the recipe ideas, Holly. It’s so versatile. Sounds like everyone has their own special way of preparing it.